The theory of plate tectonics explains the formation, movement, and subduction of Earth’s plates.As the plates move, they collide, pull apart, or grind past each other, producing spectacular changes in Earth’s surface. These changes include volcanoes, mountain ranges, and deep-ocean trenches. Volcanic belts form along the boundaries of Earth’s plates. At plate boundaries, huge pieces of the crust diverge (pull apart) or converge (push together). As a result, the crust often fractures, allowing magma to reach the surface. Most volcanoes form along diverging plate boundaries such as mid-ocean ridges and along converging plate boundaries where subduction takes place. Diverging Boundaries: Volcanoes form along the mid-ocean ridges, which mark diverging plate boundaries. Many volcanoes form near converging plate boundaries where oceanic plates return to the mantle. One major volcanic belt is the Ring of Fire, formed by the many volcanoes that rim the Pacific Ocean. Through subduction, the older, denser plate sinks beneath a deep-ocean trench into the mantle. Earthquakes often occur along transform boundaries. The movement of Earth’s plates has greatly changed Earth’s surface. 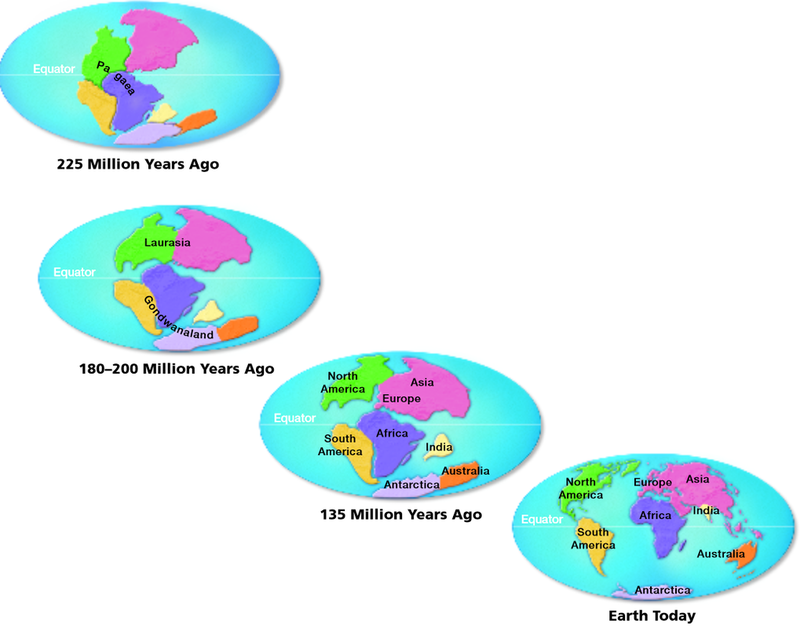 Pangaea itself formed when Earth’s landmasses drifted together about 260 million years ago. Then, about 225 million years ago, Pangaea began to break apart.